MOSCOW, Russia -- The daughter of a former Russian prime minister has accepted the job of deputy governor in a Ukrainian region, a decision that has sparked criticism in both Russia and Ukraine. Maria Gaidar, a liberal youth activist, speaks during an opposition rally in Moscow. The daughter of a former Russian prime minister is under fire from both Russia and Ukraine for taking the job of a deputy governor in a Ukrainian region. Maria Gaidar’s appointment as deputy governor of Odessa, now led by former Georgian President Mikhail Saakashvili, has been painted as a betrayal in Russia. Maria Gaidar's appointment Friday as deputy governor of Odessa, now led by former Georgian President Mikhail Saakashvili, has been painted as a betrayal in Russia. In Ukraine, she has been criticized for being hesitant to denounce Russia's annexation of the Crimean peninsula. Introducing Harvard-educated Gaidar in Odessa on Friday, Saakashvili described her as "one of the most brilliant political leaders fighting Putin's regime." Saakashvili was Georgia's president during his country's brief war with Russia in 2008. Gaidar, 32, is the only daughter of the 1990s reformist prime minister Yegor Gaidar and is an opposition activist in her own right. She served as deputy governor in Russia's Kirov region in 2009-2011 and advised Moscow's deputy mayor in 2012-2013. Gaidar's appointment caused bitterness in Russia and criticism from Ukrainian nationalists who resent another foreigner appointed to a top job. 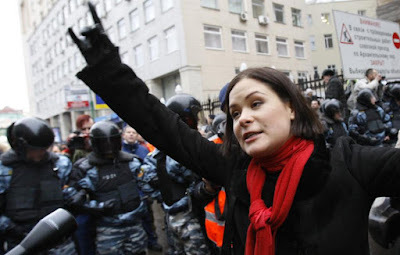 Some feel she has not been radical enough in denouncing Russia's annexation of Crimea. Gaidar told reporters in Kiev on Monday that she supports Ukraine's territorial integrity. "It was illegal and immoral and Crimea should be returned to Ukraine," Gaidar said but added that she doesn't know "how it can be done." She said she would focus on improving the living conditions of the hundreds of thousands of refugees from eastern Ukraine who have poured into Odessa. In Moscow, the human rights ombudsman Ella Pamfilova said Gaidar's Moscow-based foundation could be stripped of half of a 2 million ruble ($35,000) presidential grant following her appointment. Yegor Gaidar, who died in 2009, was a Russian prime minister in 1992 who orchestrated crucial but painful economic reforms after the collapse of the Soviet Union.